If you have stained or dirty plastic kitchenware, using a cleaning solution for plastic food storage containers will help make the job of cleaning them much easier. Since plastic containers often become stained with regular use, it's important to know how to clean them properly. Taking the time to clean your plastic food storage containers thoroughly can help you save you money by ensuring that the containers you already own will last as long as possible. 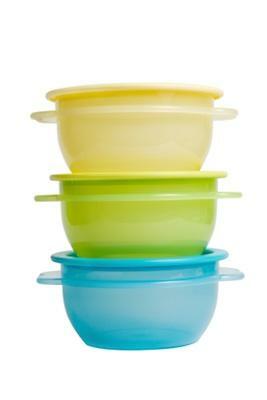 Plastic bowls and storage containers are the standard for storing and serving food in today's kitchen. The types of plastic these storage containers are made of vary. Some containers are made of hard plastic that does not absorb stains, while other types of plastic are soft and become discolored or stained easily. Plastic containers can also absorb smells. A mixture of dish soap and hot water makes a great cleaning solution for plastic food storage containers and should be used before any harsh cleaning solutions. Fill your kitchen sink with hot water and a few drops of dish soap and submerge the plastic storage container. Use a washcloth and wipe it down. Rinse with clean water and let dry. Plastic will get stained if you store foods that are acidic and colored red or green, such as tomato sauce. If you made the mistake of storing tomato sauce in a plastic dish, regular soap and water will not be sufficient to remove it. The best cleaning solution for stained plastic is one that contains bleach. The bleach solution should be left in contact with the stained area of the plastic for a few minutes, until you see the stain diminish. Be careful not to let the bleach touch any washcloths or clothing, as bleach will remove the color in them as well. Using abrasive cleaners on plastic is not recommended, as they will scratch the surface. Scratches in plastic tend to collect more dirt and get stains more easily than the original smooth surface, so it's important to take care to avoid scratching your containers when trying to clean them. Sometimes using a simple homemade solution is best for cleaning kitchenware including storage containers. Any of the following cleaning solutions are appropriate for plastic. In a bowl, mix baking soda with a few drops of water until it is a soft paste. Use a washcloth with the soft scrub paste to clean the plastic container. In a bowl, mix 1 tablespoon vinegar, one tablespoon ammonia and 1 teaspoon baking soda and two cups of water. Mix equal parts of bleach and water and let it sit in the stained storage container. Rinse several times with clean water and then let it dry. Squeeze the juice of a lemon in the dirty plastic container and let it sit for an hour. Take the plastic container outside and let it sit in the sun for several hours during the peak sun part of the day. The sun acts similar to bleach in removing stains and foul odors from plastic. When making your own homemade cleaning solutions, do not mix bleach with an acid such as vinegar or ammonia. The fumes emitted will be toxic and can make you sick. Preventing your plastic from getting stained or caked with built up grime is important. Regularly wash your plastic dishes in hot soapy water. Do not store acid types of foods such as tomatoes or split pea soup in plastic. Avoid storing foods with intense food coloring in plastic as well. It is usually fine to put plastic in your dishwasher, but check to make sure if it is only safe for the top rack.